These hand therapy exercises can help you improve your fine motor skills. Hand strengthening exercises like these can also help prevent conditions like arthritis from getting worse. 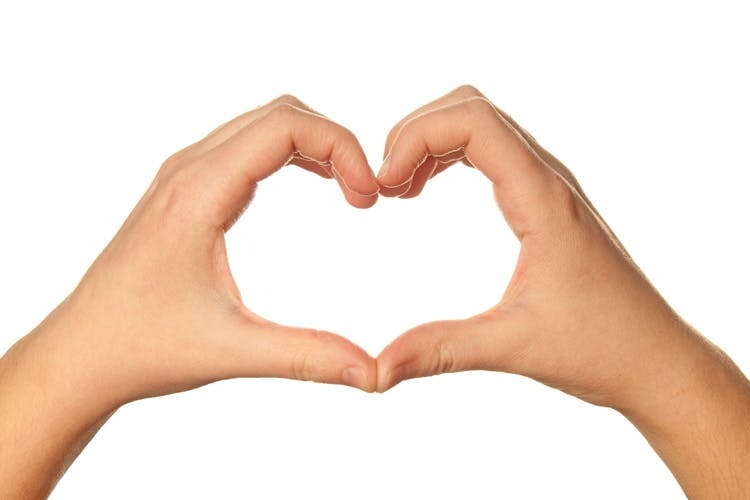 If you want some effective physical and occupational therapy exercises for your hands, read on! For those with paralyzed hands from neurological injury like stroke, you should start with passive exercise. This means using your unaffected hand to help your affected hand complete the physical therapy exercises. Not only will this will help prevent muscle stiffness, but it can also help introduce movement into your affected hand. 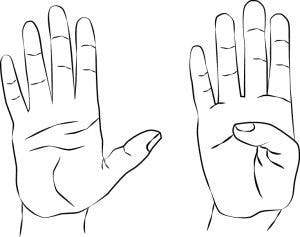 For those who do have some hand mobility, you can practice these hand therapy exercises actively (meaning no assistance from your unaffected hand) as a good warm up activity. With your forearm on a table, let your hand hang off the side of the table with your palm down. Then, move your hand up and down, bending at your wrist. When you’re done, repeat with your palm facing up. Start with your palm open, as if you were signaling the number 5. Then, practice moving your thumb over to your pinky side, as if you were signaling the number 4. Continue to move your thumb back and forth between these 2 positions. Place your hands in your lap and interlace your fingers. Then stretch your affected arm palm-side up. You should feel this stretch all the way up your inner arm. Hold this stretch for 20 seconds and release. Then, repeat on the other side. With your fingers still interlaced, gently bend your affected wrist backward and get a nice stretch there. Hold this stretch for 20 seconds and release. Repeat on the other side. For those with some hand movement, try these simple tasks that involve common household items. These are great for hand strengthening occupational therapy at home. Grab a handful of loose change and practice stacking coins on top of each other. This will help improve your fine motor skills. Take a clothespin and practice pinching it with different fingers. Start with your thumb and index finger, then move onto your thumb and middle finger, ring finger, then pinky. If you want to make things more fun, try playing board games like checkers or chess which require you to practice your fine motor skills as you move your pieces. A great hand therapy exercise that also works your cognitive skills! Getting back to playing instruments is a more advanced hand therapy exercise. To work your way up there, try downloading a virtual piano- or guitar-playing app and practice on your phone. And now it’s time to meet Barbara, our favorite physical therapist. Try her expert hand therapy exercises in this video (or by following the written instruction below). Place your hand palm-up on a table. Then use your non-affected hand to flip your hand palm-down. Repeat 10 times. Gently bend your wrist back and forth while supporting your arm on the table. Repeat 10 back-and-forth movements. 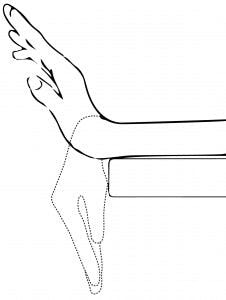 Place your affected hand palm-down on the table and use your other hand to bend your wrist side-to-side. Grab a water bottle or soup can and place it into your affected hand with your palm-side up on a table. Then, practice curling your fingers in to grasp the bottle or can, and then relax. Repeat 10 times. Take the same object and hold it in your affected hand. Then, practice bending your wrist up and down. Take a pen and place it on a table. Then, practice gripping the pen with your affected hand and move it across the table. Release, and repeat by bringing the pen back to the other side of the table. Take the same pen and practice spinning it with your thumb and index finger. Place 8 coins neatly in a row in your hand. Then, practice placing them down one by one while keeping the other coins in your hand with your other fingers. Practice touching your thumb to each of your fingertips, starting with your index finger and moving down toward your pinky. This is the same movement used in MusicGlove hand therapy, which has helped many stroke patients improve hand function. 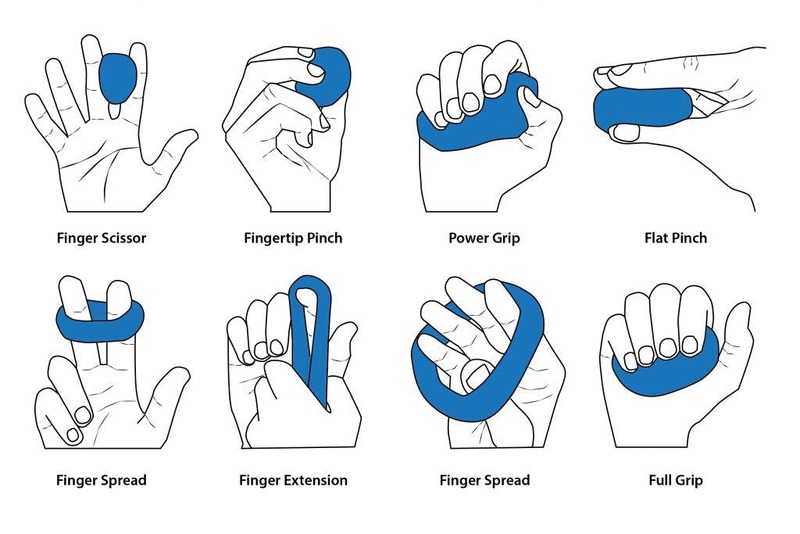 Try using a soft one if you’re still developing hand coordination and dexterity, and use something more firm if you’re focusing on hand strength. Hand therapy balls usually come in different thicknesses so that you can keep yourself consistently challenged. Squeeze the hand therapy ball with your fingers and thumb. Focus on pressing the pads and tips of your fingers into the ball. Pinch the ball with fingers and thumb extended. Press your fingers down into the top of the ball and your thumb upward on the bottom of the ball. 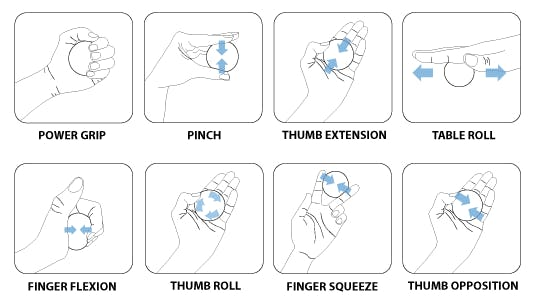 Roll the ball up and down your palm by flexing (making your thumb bent) and extending (making your thumb straight). This will move the ball up and down your hand in a somewhat straight motion. Roll the ball from the tip of your fingers to your palm. Hold the ball in your palm and press your fingers into the ball. This is different from the power grip above because you’re focusing on an inward movement instead of a global gripping movement. Imagine that you’re pressing your fingers stright into your palm. Use your thumb to roll the ball in a circular motion on your palm. Squeeze the ball between two fingers – any two fingers you please. Roll the ball side to side on your palm using your thumb. If you’re looking for something more creative than therapy balls, then hand therapy putty exercises are just the thing you need. Once you’ve mastered the complex hand manipulation exercise, you’ll be ready to work on performing rotation and shift exercises. Take a pen, and try rotating it around your middle finger, using your thumb, index, and ring finger to help you manipulate the pen. Think about twirling the pen around your fingers. Then, practice a shifting movement by holding the pen in a writing position (in between your thumb, index, and middle finger) and shifting the pen forward until you’re holding the end of the pen. Then, shift the pen back until you’re holding the tip once again. Think about inching your fingers along the pen. Gather 10 small objects (like uncooked beans) and practice picking them up with your fingers. But instead of immediately setting them down, try holding all of the objects in your palm while you continue to pick the rest up. Then, once all the objects are in your hand, practice putting them down one by one. For a structured, proven approach, try MusicGlove. It helps stroke patients achieve high repetition of hand exercises, which helps rewire the brain so that you see results faster. And that concludes our hand therapy exercises! We hope you find them useful on your road to recovery. Download 35 Hand Therapy Exercises for Free! Get instant access to our free, illustrated "35 Hand Therapy Exercises for Stroke Patients" ebook by signing up below! It contains all our best exercises all in one place. "My husband had a torn aorta and underwent emergency open heart surgery, then there were multiple complications and he was on life support for 10 days. After 10 weeks in the hospital, he is expected to make a full recovery. The biggest hurtle to his recovery has been his left hand, between the muscle atrophy and brain trauma, he had very little control of it. As a professional musician, being unable to even hold a guitar was hard, to say the least. Despite weeks of PT & OT, his hand function had barely improved. We ordered the MusicGlove and received it in 2 days. He began using it right away. He spent over an hour with it the first day. That is what makes it work so well, it's way more interesting and rewarding than trying to pick up a peg. In OT, he struggled to do any of the exercises, and the at-home exercises were mainly strengthening. After only a few days with the Music Glove, he was able to pick up and hold his guitar. and after 3 weeks, he can play 3 chords. The MusicGlove and program are engaging. He uses it daily for an hour - and he wants to do it. His 1st time using it, I could barely get it on, his hand was moving so much; his accuracy was about 30% and he had difficulty even doing some of the fingers. Now, after only a few weeks, his uncontrolled motion is about 60% better, I can easily & quickly get the glove on, his accuracy is over 90% - on all fingers, and he now can do multiple fingers. I would highly recommend this product." Repetition is the mother of all skill. The more you practice something, the better you will get at it. And the more frequently you practice, the faster your will improve. Jill's husband proved that frequent practice leads to the best results.